This is an often-ignored album from Rod Stewart, yet it is not a bad one at all. It contains a mixture of cover versions and original Stewart songs. The awful synthesised backing that blighted the eighties was thankfully long gone and he is backed by a proper rock sound. The opener is a cover of Chris Rea's evocative, bluesy mid-tempo rock of "Windy City" and it is delivered well, with a moving vocal and some suitable excellent guitar (a Rea cover without some good guitar would be a travesty). It is a great song anyway and suits Stewart perfectly. "The Downtown Lights" is a laid-back slow number. Somehow, now, in 1995, songs like this are being given a much better backing than similar songs were being given ten years earlier. It is an atmospheric song and sounds great here. This is a far better album already than anything Stewart put out from 1981 to 1991. "Leave Virginia Alone" was a song written by Tom Petty intended for his "Wildflowers" album but instead he gave it to Stewart, who did it justice. It is a mid-tempo rock song with both electric and acoustic guitars at work. Bob Dylan's "Sweetheart Like You" is similarly well done. These were still the days when Stewart could enhance any cover he touched. Ten years or so later, this ability would have left him, but here it was still very much present. "This" is a bit of an unremarkable but pleasant enough big production ballad. "Lady Luck" has a Celtic, folky air to its intro and proceeds into a likeable, jaunty "Maggie May"-style Stewart rocker, with his wry, observant lyrics to the fore. His vocals have that late seventies lilt to them that is always so fetching. Admittedly, this album isn't ground-breaking or relevant to the musical culture of 1995 in any way, but it is a lovely blast from the past. "You're The Star" treads a well-trodden path of praise for his latest love in the "You're in My Heart" fashion. This time, however, it wasn't written by Rod, but by old mate Frankie Miller. It sounds so like a Stewart song, though. 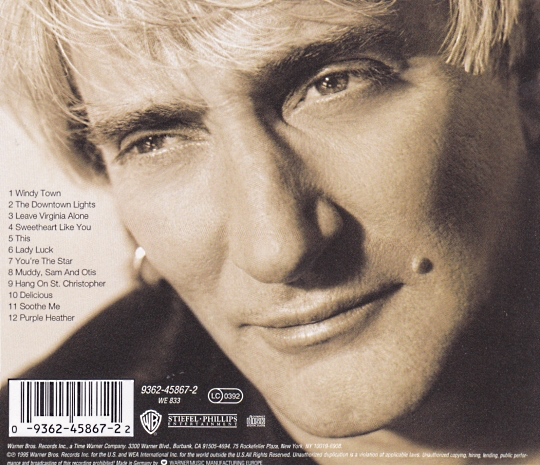 "Muddy, Sam And Otis" is one of those typical Rod Stewart nostalgic songs for times and music gone by. It is a little bit cheesy, but I can't help but like it. It has a delicious chorus refrain. Tom Waits' "Hang On St. Christopher" is a rumbling, brass-driven bluesy slow burner with a great down 'n' dirty feel to it. Stewart hasn't sounded this good in years. Great stuff. It has some excellent B.B. King guitar at the end as well. "Delicious" is a thumping, rousing rocker with typically lusty lyrics. Nothing new here, but enjoyable enough. "Soothe Me" is another rocker which blatantly uses the riff from T. Rex's "Get It On" and it has a Sam Cooke-esque hint in its melody. It uses the "Hot Legs" riff too at the end. These two regulation rockers threaten to end what has been an impressive album on a bit of an average note, but the final cover of the traditional folk air, "Purple Heather" is gorgeous, romantically-delivered by Stewart. This has been a much-underrated album worthy of anyone's attention.